The pesticide adhesion to the back of leaves is improved. Spraying on crops is effective, economical and environmentally friendly due to less fall loss of pesticide. It runs with 4 AA Alkali batteries under Economy Mode for 15 hours and Turbo Mode for 8 hours. Using time may fluctuate by the performance of the battery. Improved design of original electrostatic technology by downsizing the electrode. 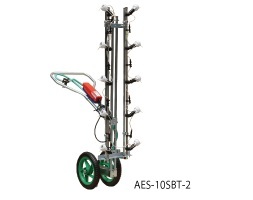 Ideal for pest control of standing crops such as cucumbers, eggplants and tomatoes. 4 heads reduces the amount of time and energy for application. Improved design of the original electrostatic technology by downsizing the electrode. Nozzle lances are adjustable both vertically or horizontally so useable for both standing crops, such as cucumbers, tomatoes, eggplants, etc., and flat crops, such as watermelons, strawberries, cabbages, etc. Improved design of the original electrostatic technology by downsizing the electrode. Nozzle lances are adjustable both vertically or horizontally so useable for both standing crops, such as cucumbers, tomatoes, eggplants, etc., and flat crops, such as watermelons, strawberries, cabbages, etc.